The dedicated clean area at our Bluemay Weston sister company produces cap liners and seals for many applications including bottles, jars and pump dispensers, aluminium caps and containers. These are currently used in a variety of products for many well known household names and can be supplied on extremely short lead times or on the day required to an agreed schedule. 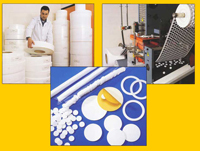 Other options in this area include in-line application of self adhesive backing and roll packing if required. There is no minimum order quantity for products made from stock materials. Materials are of the highest standard and a significant stockholding coupled with positive partnerships with raw material suppliers mean the right product with the minimum of delay. In the case of very urgent requirements usually it is possible to assist with at least a partial delivery within a day or two. Contact our technical Sales Team at Bluemay Weston on 01769 574574 to discuss your requirements.